This is most definitely on my list of favourite kids' books so far this year. 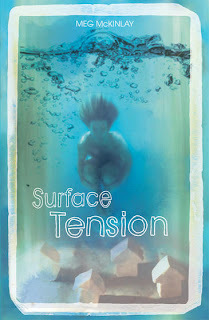 Original, gripping, poetic, authentic - these are the words that spring to mind during and after reading Surface Tension, a book that kept me reading far longer than I should have at each sitting. Cassie feels on the outskirts of everything. Her family, her life, even her town. Born into a brand new town, on the day that the old village was dammed, Cassie has always felt drawn to the lake. There's a whole town down there; people's homes, their lives and deaths and memories all lay underneath. When Cassie abandons the local pool to complete her daily swimming ritual at the lake, she doesn't realise what she and her friend Liam are about to uncover. It seems that along with everything else, some people have secrets hidden below the surface. McKinlay - novelist, picture book author and poet - has created a stunning novel that is a must-read for girls (although it isn't a 'girly' book, the story, characters and writing style will attract girls). Her words inspire thought, question and emotions that will stay with readers long after that final page. I almost can't wait for my toddler to grow up so I can share this one with her. Almost.